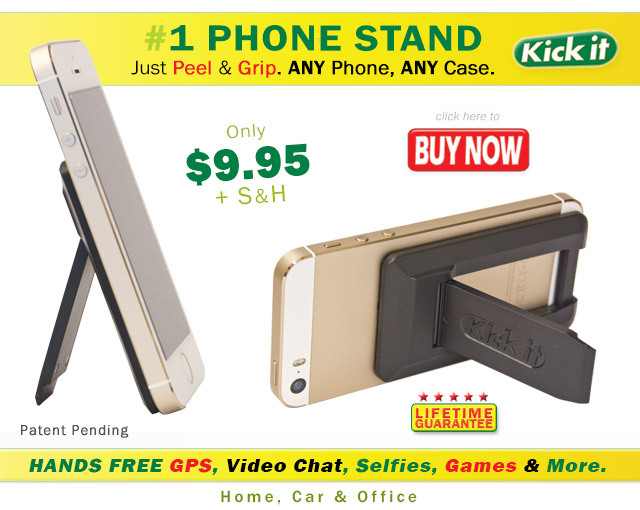 #1 Mobile Phone Stand that fits ANY PHONE or CASE. LIMITED TIME ONLY! Mobile Phone Wallet. See below. 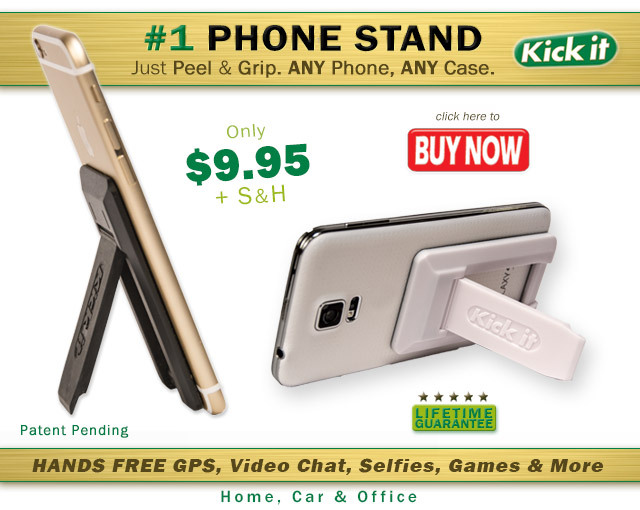 The Best Cell Phone Wallet Accessory that is fully compatible with the Kick it Cell Phone Stand. Use included GRIP PAD on dashboard for Hands Free GPS, Charging & Speaker phone. Turns your device into a cell phone stand for car. 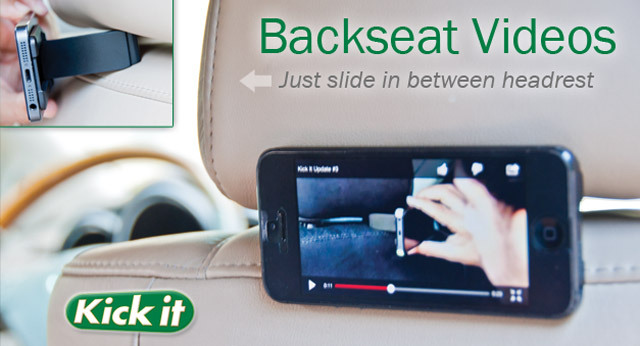 Works as a cell phone holder for car by wedging in back head rest. 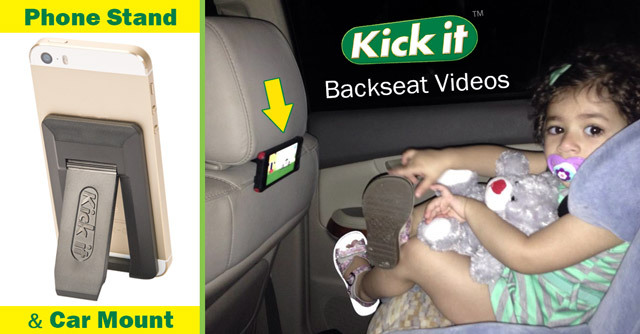 Cell phone mount to enjoy backseat entertainment for your kids. 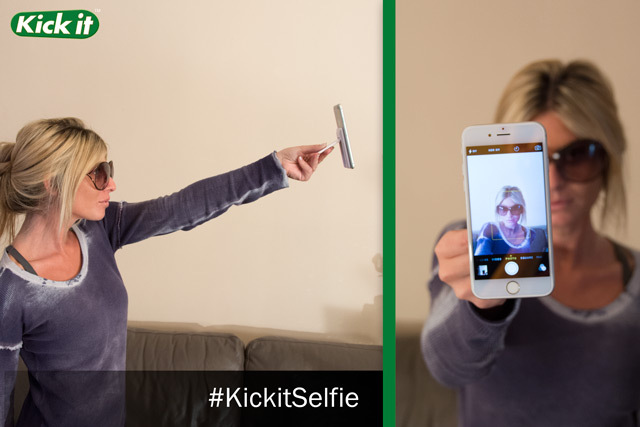 Kick it is the best cell phone camera stand ever made. Use the leg to get that extra few inches that are crucial for selfies and be able to make use of the high quality camera phone instead of the low resolution front facing camera. No need to carry a separate, bulky selfie stick. Set up kick it cell phone camera stand for hands free selfies & self photography anywhere you go. Just use the built in self-timer options on your camera phone. 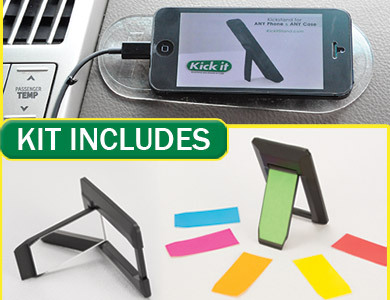 Kick it Cell Phone Stands Fit ANY Phone, ANY Case or Mini-Tablet. The Secret is in the micro-suction grip technology that allows it to be placed and removed an unlimited amount of times without ever losing strength. Kick it Mobile Phone Stands work with and has been tested on the following: iPhone6, 6+, 5, 4S, 4G, 3, iPhone 6 Case, Samsung Galaxy S5, S4, S3, Samsung Galaxy S5 Case, Samsung Note 4, 3, 2, Samsung Note 4 Case, LG G3, G2, LG G3 Case, OnePlus One, HTC One (M8), HTC One Case, Sony Xperia Z3 Case, Z1, ZR, SP, Z2, Motorola Moto X Case, HTC Desire Eye, Motorola Moto G Case, Nexus 5 Case, Lenovo Case, Hauwei Case. Kick it’s stealthy design is both light and smooth. It hugs tight to your phone and glides in and out of your pocket. You won’t even feel it. Kick it becomes one with any phone or case. 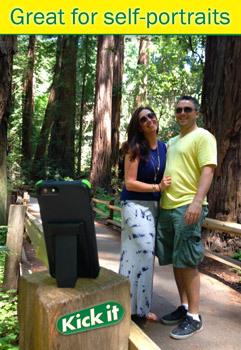 We tested and tweaked it on many phones and cases until we created the ultimate kickstand. Peel & stick it on to any phone or case and “Just Kick it”. 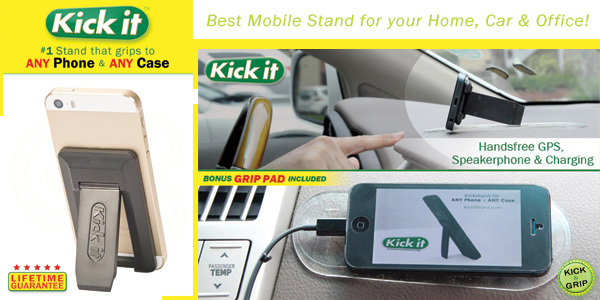 Kick it Phone Stand is the best Cell Phone Holder and Cell Phone Car Mount on the market.